During his keynote speech, Microsoft’s Satya Nadella introduced the Operations Management Suite (OMS). This suite is the IT management solution for a mobile-first, cloud-first world. OMS is a single solution that is built to manage your entire enterprise environment regardless of operating system, hypervisors, their location or your choice of cloud providers. The Operations Management Suite manages your Windows and Linux workloads across your datacenter. Through this rich platform powered by Azure, Operations Management Suite delivers a unified IT Management solution enabling you to extend your System Center investments and simplify the management of your datacenter assets regardless of OS type, or what cloud provider you utilize. YES! You heard that right. This suite will enable you to manage assets in your datacenter regardless of of whether you use Azure, Amazon Web Services (AWS), Open Stack or some other cloud provider. Operations Management Suite is a cost-effective all-in-one cloud management solution. Log Analytics: Collect and search across multiple machine data sources to easily identify the root cause of operational issues. Automation: Automate manual and frequently repeated tasks for more efficient and cost-effective hybrid cloud management. Availability: Backup and enable integrated recovery for all your servers and applications, no matter where they reside. Security: Identify malware status and missing system updates. Collect security related events and perform forensic, audit and breach analysis. Here’s a screenshot of what the overview page of this suite looks like. 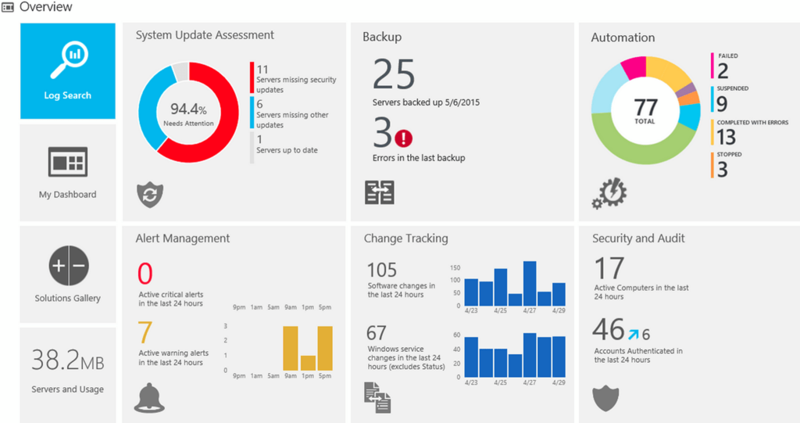 If you’ve noticed that this bears a striking resemblance to Azure Operational Insights, which was in preview, and became generally available on May 4, 2015, then you are right. Azure Operational Insights is now a part of the Microsoft Operations Management Suite.